The Order of the Grey Beard (O.G.B.) may be bestowed to active fighter's age forty or over. 1.) The wisdom of age is not unsurpassed by the enthusiasm of youth, as proven by the valiant ___________, whose prowess remains undiminished by the years. We the Crown Trimaris honor that endurance, and so do recognized them as a proven Companion of the Order of the Grey Beard, signed upon the ______ day of ______, A.S.__________. 2.) Chivalry and courtesy are no less appreciated when exhibited by the elder than the youth. For continued skill and gallantry on the field, let _______________ be named a member of the Order of the Grey Beard, Trimaris. Being so proclaimed this _____ day of _____, Anno Societatis, ______. 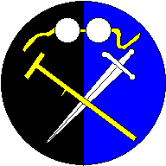 Per pale sable and azure, in saltire a crutch Or and a sword inverted proper, in chief a pair of eyeglasses argent stringed Or.